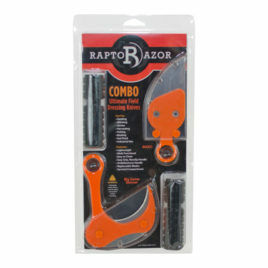 The ultimate field dressing knives from Raptorazor. These blades are no dinosaurs...making processing game quicker, easier and cleaner - you are sure to be as impressed with these revolutionary blades as we are. Designed with the extreme hunter in mind. This ultra lightweight knife set weighs in at just 8.1 oz total. Over 18s only.